The Candy Dragon's horn may look sweet, but try tasting it and your sweet tooth will immediately become a giant cavity. It's an effective defense mechanism against hungry dragons and children. The body style of the Candy Dragon is reptilian. It is a colorful Dragon that has large stripes in orange, red, yellow, light blue, and pink. It has two pink and white striped horns, webbed ears, three parallel rows of spinal plates and blue eyes. Its tail curls up and resembles a swirled piece of candy. 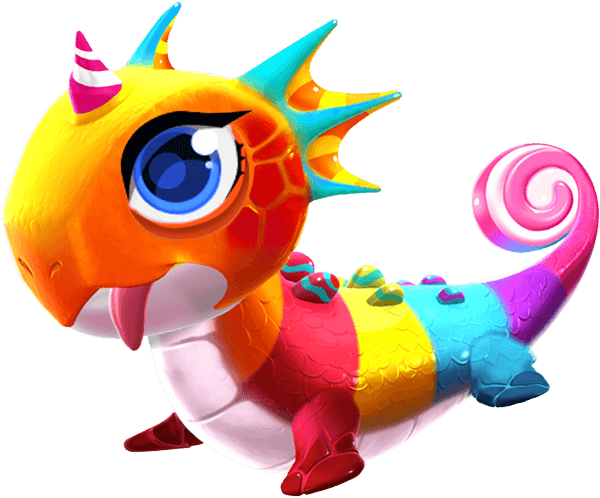 The Candy Dragon is a Normally-Breedable Dragon which can be obtained through the breeding of two Dragons having together the Plant and Water Elements or through purchasing it from the Main Shop in exchange for 400 Gems. Both methods require the Trainer to have reached Level 11. 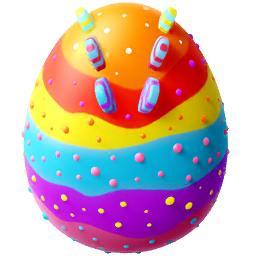 Breeding for this Dragon takes 8 hours while incubating and subsequently hatching the resultant egg takes 11 hours and 20 minutes. With an active VIP Status of Level 2 or higher, the breeding time is reduced to 6 hours and 24 minutes while the hatching time is reduced to 9 hours and 4 minutes. This page was last edited on 12 April 2019, at 17:36.